Online retailer Amazon announced plans Wednesday to buy energy from what will be Virginia’s largest solar farm in Accomack County. Amazon Web Services, part of Amazon’s cloud services, will buy the energy from Community Energy Inc. as part of Amazon’s plan announced last year to use renewable energy for all its infrastructure, including its many data centers in Northern Virginia. The planned 80-megawatt solar farm, to be completed by October 2016, represents more than five times of all the solar energy currently installed in the state, according to the Solar Energy Industries Association. Virginia ranks 30th in the country in solar energy capacity, according to the association. Dominion Virginia Power, the state’s largest energy provider, is building its largest ground set of solar panels — a 2.45-megawatt array — on Philip Morris USA’s property on Bermuda Hundred Road in Chesterfield County. That project will involve about 8,000 solar panels on 25 acres, generating enough electricity to power about 500 homes under optimum conditions. The Accomack County project, known formally as Amazon Solar Farm U.S. East, will use 250,000 solar panels across 900 acres. That would generate enough electricity to power about 15,000 homes in a year. The energy generated will be put onto the electrical grids that supply current and future Amazon Web Services data centers in the central and eastern U.S., the company said. The roughly $200 million project will create 300 to 400 jobs when construction begins next year, said Community Energy President Brent Alderfer. Zoning for the project has been approved, and work on the final design is being finished before applying for a building permit, Alderfer said. Once the project is completed, only four or five full-time positions will be required for landscaping around the panels. 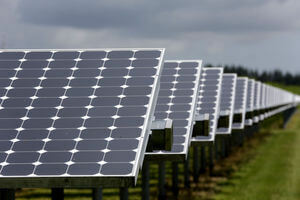 The cost of solar technology has come down enough for large companies to consider building huge arrays, Alderfer said. Amazon also operates large distribution warehouses in Chesterfield and in Dinwiddie County. It has come under pressure recently from customers, including Netflix, which have urged it to move to cleaner energy sources. Amazon said in a release Wednesday that it was a quarter of the way to its goal by April of this year. “We continue to make significant progress toward our long-term commitment to power the global A (Amazon Web Services) infrastructure with 100 percent renewable energy,” said Jerry Hunter, vice president of infrastructure at Amazon Web Services.